Dozens of Lummi Island artists–including myself–will be opening our studios to visitors from 10am to 5pm each day for our 2016 Labor Day weekend Lummi Island Artists’ Studio Tour. There are two places to view my work this time. First of all, you can see my largest studio paintings at the Lummi Island Gallery (4323 Legoe Bay Road). It’s number 18 on the Tour map. Owner Bridged Lott has done a wonderful job designing the Gallery and offering an eclectic collection of work. My second location is at my home studio, number 3 on the Tour map. I’m working hard on a very special exhibit for this Studio Tour. It’s a 6×6 Show–6 rows of 6 paintings, all 6×6 inches. To make things even more interesting, all the paintings will be variations of the same scene–a clearing with a lone birch tree at the south end of Portage Island. You can see the view from my living room. Hopefully I can finish all 36 paintings in time for the Tour! Other small paintings, as well as some plein air pieces, will also be available at my home. You’ll also be able to purchase high quality prints, cards, and gift items. Check out my jigsaw puzzles! New paintings, never before shown (except online), will be at both locations. Find unique treasures for your home or business, or for gifting those special someones in your life. This Studio Tour includes more than 40 artists and craftspeople offering their work at over two dozen locations around the island. Enjoy paintings, drawings, prints, notecards, jewelry, photography, sculpture, glass, woodwork, pottery, metalwork, stonework, quilts, clothing, knitwear, and more! Have lunch at the Sauseburger stand, enjoy a wine tasting at the Artisan Wine Gallery, and finish up with dinner at the Beach Store Cafe. Information about all these businesses is on the Tour map. Enjoy a relaxing and memorable day on the Island! 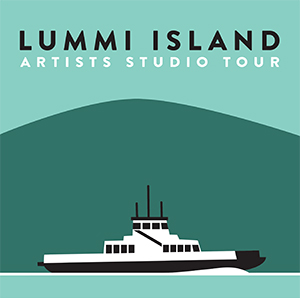 Click here to download and print the Lummi Island Artists’ Studio Tour map. The map includes driving directions and ferry information for getting to the Island easily. See you soon!